The following are my notes from a wonderful class my husband and I took to learn about the Kingdom of God. We are KEY PEOPLE. The Lord has anointed us to open key places in your city, country, and time. See yourself as the key to open the doors in your area. We bring breakthroughs! We open doors, we enter in and we overcome the darkness with the Light of God. We are key to what God is doing here and now in this region. We are the key to what God is doing here. We are a key to a slot in this society to unlock territory and breakthrough. Only the righteous can open the door. We have been declared righteous by what Jesus did for us, not by our works. 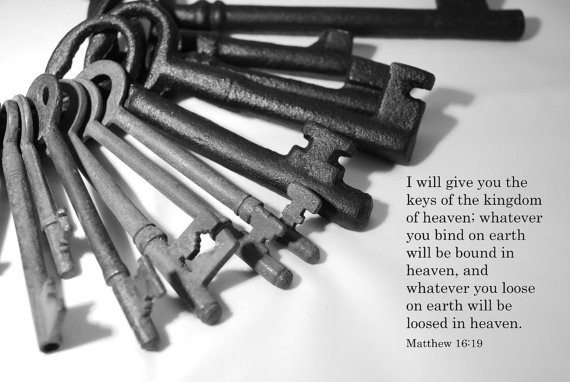 We are a key because Christ is in us. It is he who does the work. We are the solution to war the darkness in our area. If you don’t see yourself as a key person, then others won’t see Christ in you. The Kingdom of God is within you. The Kingdom of God is here, now. We work together in a team to push a cause – the cause of Christ. This cause is bigger than the giants in your land. The Cross of Christ is bigger than the obstacles. Push the Gospel Message through your ‘house’ to change people. God changes the hearts of people when they get a vision of being a Kingdom Person. That’s how we change the World. The Lord will anoint you with His Spirit and His Power to do His work. It’s not about us or our agendas. The Lord will lead you and the Holy Spirit will teach you on your journey. God will send the rain and the blessings because of the Presence of Jesus in us, not because of what we do or don’t do. This Spiritual Rain makes things grow. God has a purpose and a plan. Relationships create life. Jesus wants relationship, not religion. It’s the LIFE in the plant that produces the structure. The structure does not produce LIFE. The more Godly relationships we have – the more LIFE. Connect to LIFE. 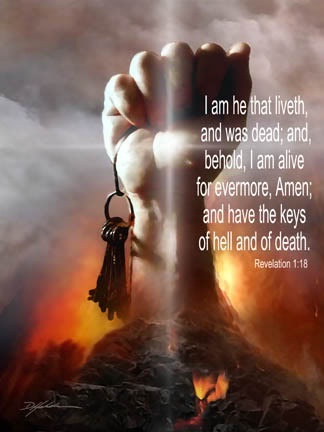 We are all Key People in the Kingdom of God. We are safe people and we create safe places. When you know who you are you can bless people. When we work together in faith ALL of God’s people are key components. Our faith and our relationships will grow. Just as a baby born with a baby skeleton grows over time, we will adapt and change to facilitate growth. We will all bear fruit. We all have something to say. Don’t disqualify yourself! God has already qualified you for the work He has for you. God has make you for such a time as this. You are a Key Person to unlock destinies and overcome the darkness in the world around you. Let go of old concepts and embrace the new ones that God shows you. We are dynamite. and we receive power from on High to be His Witnesses. He will accomplish amazing things through us. Posted in Kingdom Authority, Spirituality and tagged Body of Christ, breakthrough, christianity, encouragement, faith, Holy Spirit, Identity in Christ, Inspiration, Jesus, keys to the kingdom, Kingdom of God, Kingship and kingdom of God, Matthew 16, Overcome, Religion and Spirituality, Spiritual Identity, Spirituality. Bookmark the permalink.